Because nothing beats a classic white shirt / blue jeans combo! WATCH Cartier Tank Americaine. SHIRT Iro x Anja Rubik. BAG The Row. EARRINGS Sophie Buhai. PERFUME Rodin. JEANS Balenciaga. FLATS No.21. LIPSTICK Lipstick Queen. 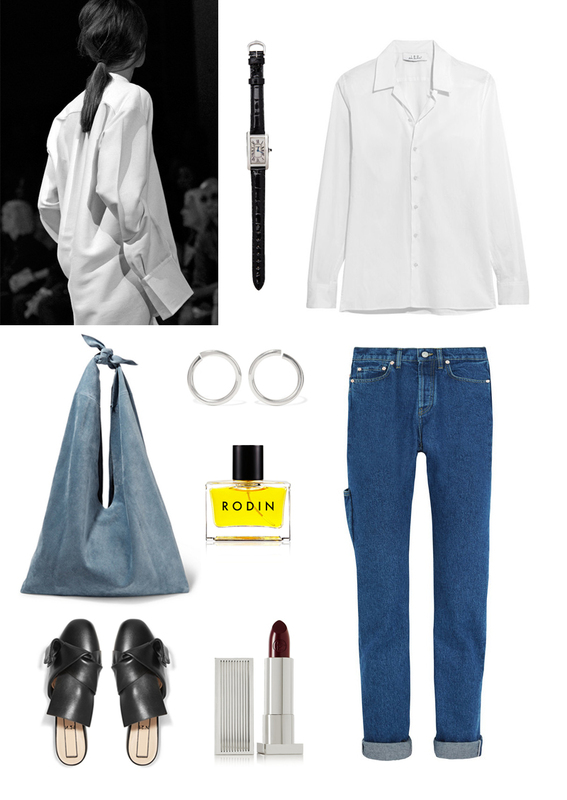 This entry was posted in Shopping and tagged Cartier, rodin, sophie buhai, The Ro by Carolina Engman. Bookmark the permalink. I always love how a white shirt, blue denim and red lips can take you literally anywhere. You can go to the office, you can go on a date or you can just meet your girls in the park! Love every single piece! Wonderful look, I love the shoes! Love this outfit!! Looks so nice! Nice selection, love the shoes! the blue match the white always the classic match, make women pure and fresh. Fabulous bag – great simple pieces that make a marvelous outfit. I really love this pair…thanks for sharing!